Many people of Christian faith support the idea the Big Bang origin of the universe, and you shouldn't be surprised - it does fit in very well with the Christian idea of the creation. Indeed, Georges Lemaître, one of the originators of the Big Bang theory, was a Catholic Priest. Christianity says that there was a beginning, which was recent in the sense that we have a history of what has happened since. You may not think of thirteen billion years ago as being recent, but you should compare it with the Lifetime of Brahma which is over 3×1014 years, and even that is just part of an infinite number of cycles (although a 'Day of Brahma' fits in very well with the age of the Earth). In any case the most important time in the Christian Universe was not that of creation but the coming of Christ. Christianity also says that there will be an end. With the Big Bang we don't know whether this will be a 'Big Crunch' a 'Big Rip' or just a heat death, but it certainly won't be 'business as usual'. So if a universe which came into existence some time in the past fits in with religious ideas of creation then, presumably, if the universe has existed for ever then there is no need for a deity to create it. Well that's what Fred Hoyle would have liked us to believe. He proposed the steady state theory, in which the universe had an infinite past, and was essentially unchanging on the largest scales. (Note the term 'Big Bang' was invented by Hoyle, as a derisory label for the opposition). Hoyle was a staunch atheist, and frequently put forward his atheist point of view. But it seems to me that linking a deity to whether the age of the universe is finite or infinite is missing the point, since time is just a label, and we can adjust this label as we think fit. It is certainly possible to change the time coordinate so that an infinte time becomes finite, or conversely that the finite time since the big bang becomes infinite. You might not like messing around with time in this way - time seems to be the one feature of the universe which we can experience directly and so it seems to have a certain natural measure to it. However, none of us have been around since the beginning of the universe, and so it isn't really possible to object to the rescaling of time on this account. In the end you need to answer the question of why there is something rather than nothing. Some would say that this means that a creator is needed, others would then ask why there is a creator rather than nothing, but the time coordinate you use doesn't come into it. If you are interested in what people think about the origin and age of the universe then you will soon encounter the 'Young Earth' creationists, who believe in the biblical account - that the Earth was created a few thousand years ago. This is often portrayed as a 'Science vs Religion' issue, but it isn't really. The scientific worldview is very much the dominant one at the moment, and as such it will have people arguing against it - but science still continues on its way. What the creationists are really trying to do is to expand their influence within the religious communities. How successful are they at this? Well in a recent poll in the UK, 22% of those asked said that they thought that humans were created less than 10000 years ago. I would note that this disagrees with the point of view of the major churches in the UK (the Archbishop of Canterbury has called creationism a 'category mistake'), so I would say that if the creationists are causing a problem, then it is a problem for religion, not for science. There is one 'solution' which is sometimes proposed to the discrepancy between the biblical age of the world, and that which is found by observation. This is that God created the universe as if it had existed for billions of years (no problem for an omnipotent being). It seems to me that there is a big problem with this idea. If you want to create something 'as if' various things had happened then you will need to run through these things in your mind. Now for us there is a clear difference between what happens in our mind and what happens in reality, but for a deity such a distinction is much more doubtful, indeed some theologies have the whole universe as existing in the mind of God. In the 1930's Edward A Milne went against the idea that a model of the universe needed to be based on general relativity, and devised a model of his own, starting from a few simple assumptions. His model turned out to be very similar to the big bang model, with the difference that gravity didn't act on the largest scales, thus his was a 'special relativistic' universe. As such, it is frequently thought of in 'special relativistic' coordinates, as being the future light cone of the big bang event. Some people see this and claim that it is proposing an 'edge' to the universe, but this again is due to confusion about what you can do with coordinate systems. In fact in this model an infinite amount of stuff is compressed into a finite coordinate distance - you wouldn't actually come to an edge. (To see how the same universe can be represented in different ways see Ned Wright's cosmology tutorial). An interesting and somewhat ironic point about Milne's model is that he wanted it to agree with his religious beliefs, and so for the universe to come into existence as a single event. The lack of gravity played a part here in that it meant that there was no particle horizons, and in the light cone view, the existence of particle horizons might be thought of as the big bang not being a single event, but extending up the sides of the cone. In comoving coordinates - those most used by cosmologists - this doesn't happen. But there's another reasonably natural choice of coordinates, that of the "conformal" space-time diagram. (See more of Ned Wright's cosmology tutorial). This stretches out the time coordinate in the early universe, but in the case of Milne's gravity free universe it stretches it out infinitely, and so gets gets rid of the creation event - probably not what Milne would have wanted. I would also note here that at that time the Hubble expansion seemed to imply that the universe was less than two billion years old, and the earth was known to be at least twice as old as that. It was also thought that the development of stars and the evolution of life might need much longer timescales - possibly as much as 1012 years. 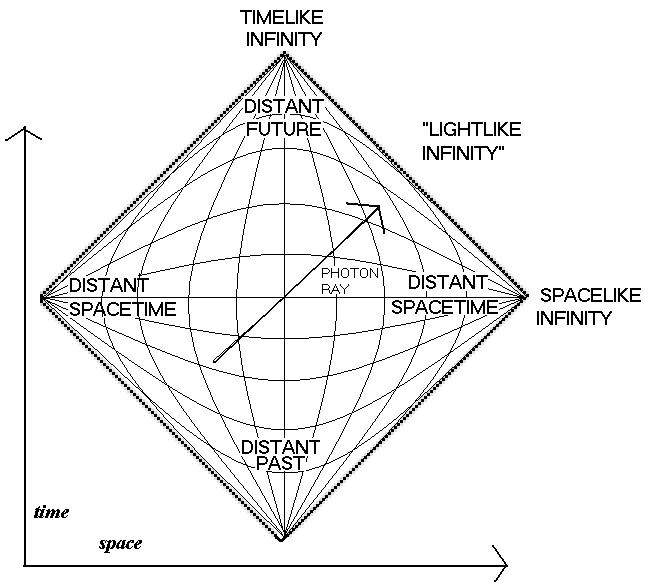 In his later work, Milne devised a model with two separate timescales, one for the expansion of the universe, and one for smaller scale happenings, emphasising again that time shouldn't be considered as absolute. One well known example of compressing and infinite amount of space and time into a finite coordinate system is the Penrose diagram. Here again one might be tempted to ask 'What is on the other side of the boundary'. Again the answer could be that this isn't a sensible question. But you could also say 'well suppose that there was something there', and postulate the existence of many different universes next to each other in the diagram. In fact, when the Penrose diagram is drawn for a charged, rotating black hole you get something very like this, and the black hole is seen as a possible portal between the different universes. In his more recent work Penrose has gone beyond rescaling time. He has noted that if we go towards an infinite heat death, then eventually nothing changes and so the universe can't keep track of time. Hence you might as well take the time coordinate out of the equations. But when you do you get something looking very like the state of the universe at the big bang. Penrose's idea is that the universe is thus cyclic, with a new big bang emerging from the heat death of the old universe in this way.